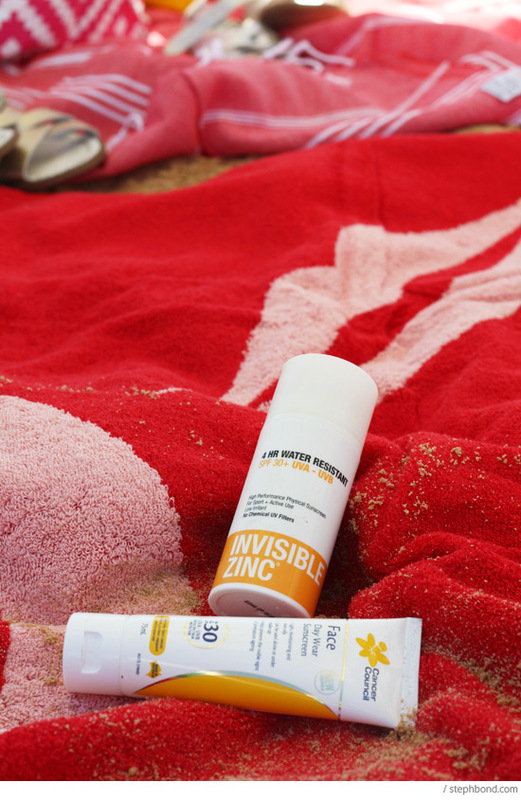 Bondville: Sun Smart beach getaway + WIN Australian beach shade and bags! 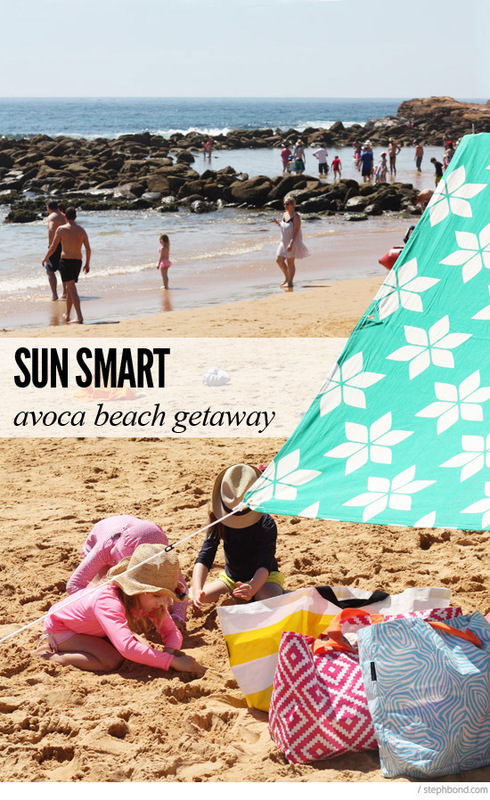 Sun Smart beach getaway + WIN Australian beach shade and bags! 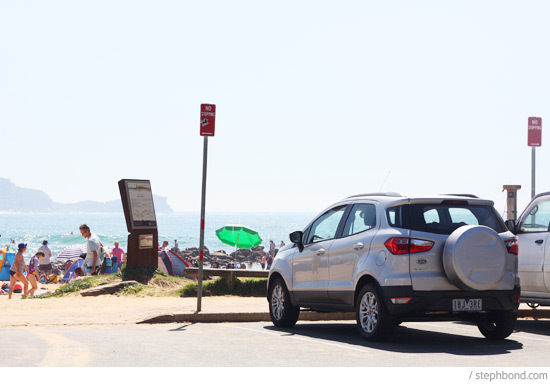 In my third Paint The Town Ford challenge as part of the Kidspot Voice Of 2014 program, our family of four drove up to Avoca Beach for a weekend getaway in my borrowed Ford EcoSport Titanium. We had glorious weather and spent lots of time on the beach with a cast of thousands. 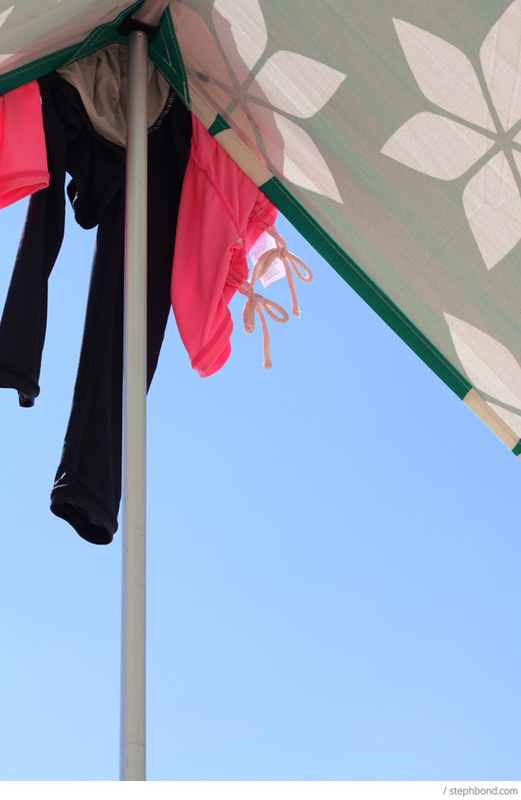 We're always conscious of being Sun Smart, and covered up in style with great Australian products. 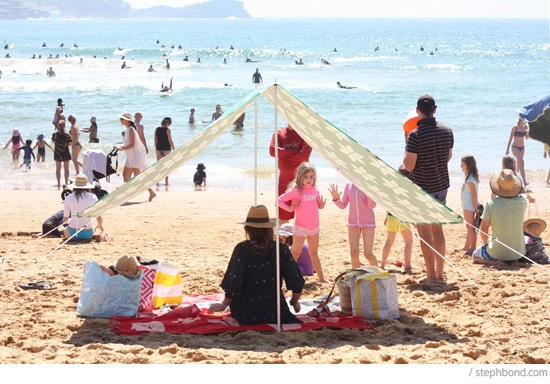 Read more for details on our weekend, my favourite Australian-designed kids' swimwear, and how you could win the amazing Hollie & Harrie Sombrilla beach tent and stylish-and-practical waterproof beach bags from Project Ten. It was a great weekend to get away from the city and we were lucky to stay with friends at theirbeach house at Avoca Beach, 90km north of Sydney. 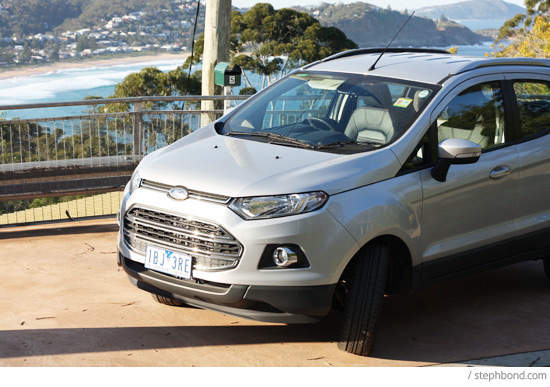 The Ford EcoSport Titanium proved its' Eco-worthiness, completing the round trip of just over an hour each way on less than a quarter of a tank of petrol. Love that. 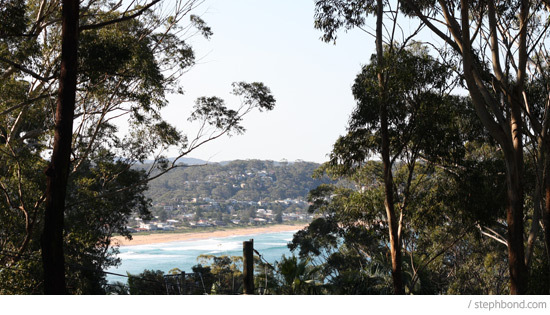 Our friends' house is set amongst trees on a hill overlooking Avoca Beach - such a peaceful spot. We kept our agenda very simple - family time on the beach before the heat of the day, down time at the beach house when the sun was at its hottest, and good old fashioned games of Rummikub into the night. Oh yes, and chocolate. And wine. After breakfast and coffee on the deck, it was time for the beach. We scored a great car park right near the surf club and outdoor shower. All our gear fit beautifully in the boot of the Ford EcoSport Titanium with plenty of room to spare. We also popped the kids' water bottles into the air-flow glove box to keep them cool (nice feature!). 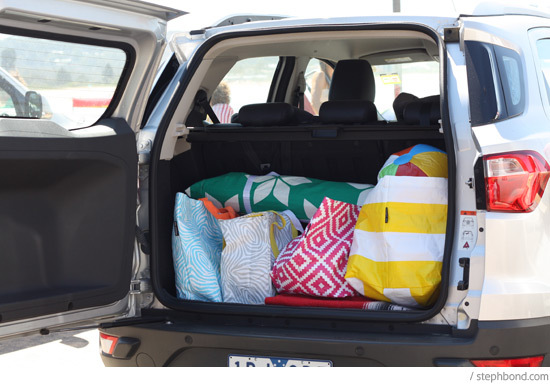 Another handy feature is the Intelligent Access push button lock on the front door handles - perfect when your arms are full of beach gear. 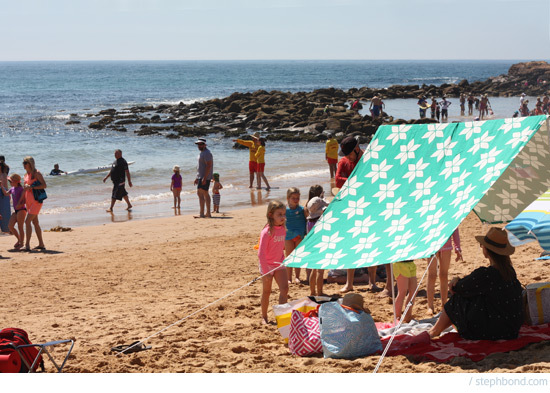 We arrived at the beach with every other Sydney-sider and pitched our Hollie & Harrie Sombrilla for instant shade. Assembling the tent was straightforward and we were ready to go in no time. I can't tell you how much we loved the Sombrilla - it is stylish and provided lots of shade without feeling suffocating. The sea breezes flowed straight through, so we weren't hot, either. And at least five people approached us to find out the brand name - definitely a head turner. Then it was time to get stuck into some serious swimming and sand play. 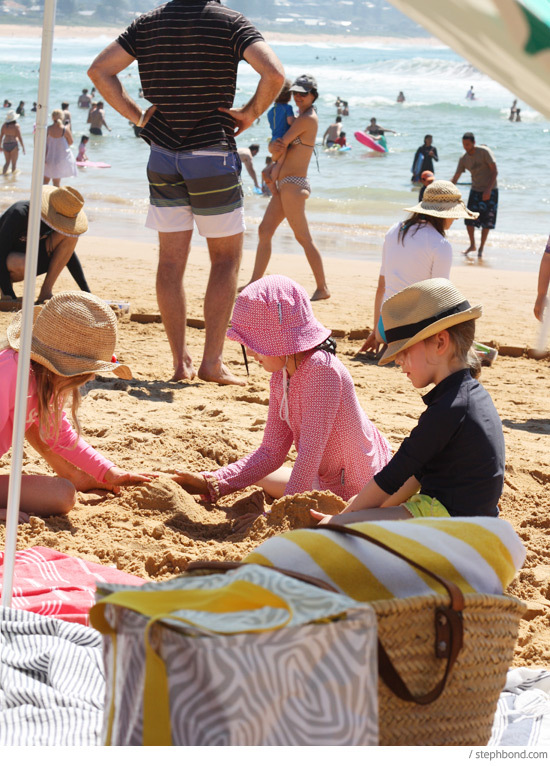 When the tummies started rumbling, we picked up excellent fish burgers from Avoca Beach Seafoods and devoured them in the shade - plenty of room for two families: four adults and four kids! After lunch it was back to digging in the sand and dips in the ocean. 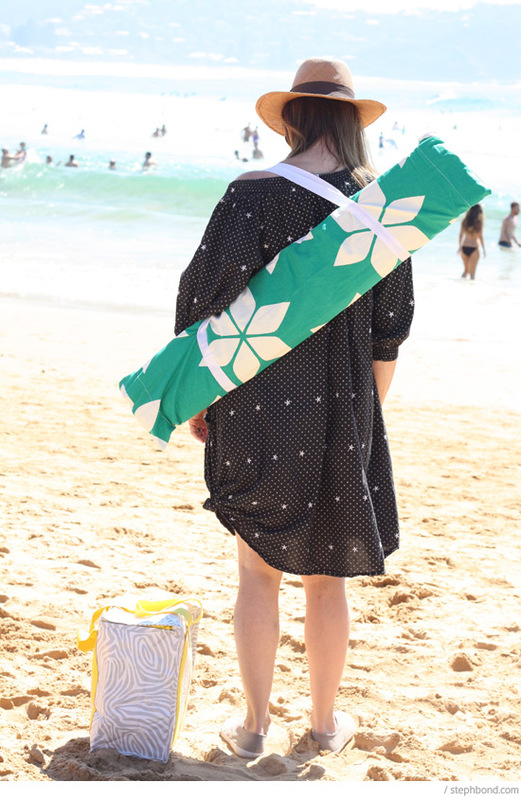 Aussie beach style: new season Sun Kissed beach towel from Kip & Co., sun screen (of course! 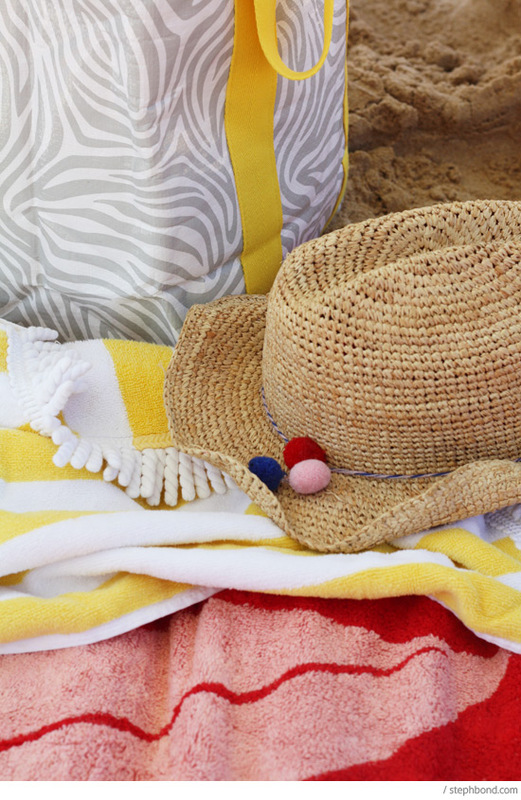 ), beach bags from Project Ten, yellow striped kids' towel from Teeny Me, well-loved hat from Country Road and sun shade from Hollie & Harrie. 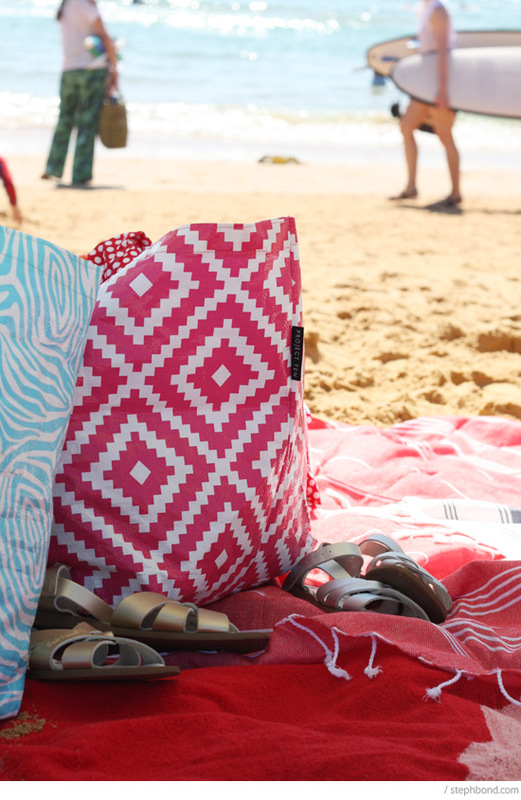 The Project Ten bags were particularly good for the beach as they are waterproof, hold an enormous amount of beach necessities, and look super-cute too. 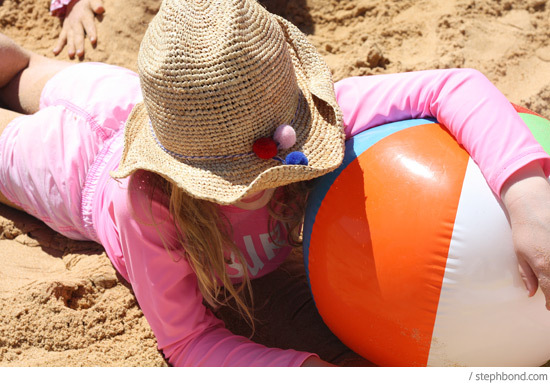 You can find these great sun-safe swimwear options at Mini Sandcrabs, Sandy Feet Australia, HeavenLee Swimwear, White Soda, Platypus Australia, and Babes In The Shade. Also try out CuddleFish, Cupid Girl, Honky Tonk, Tayla lu, and Sea Jewels for more Australian swimwear for kids. After the swim our friends popped on their cool Betty and Lola cotton towelling cover-ups with pom pom trim. We loved them! 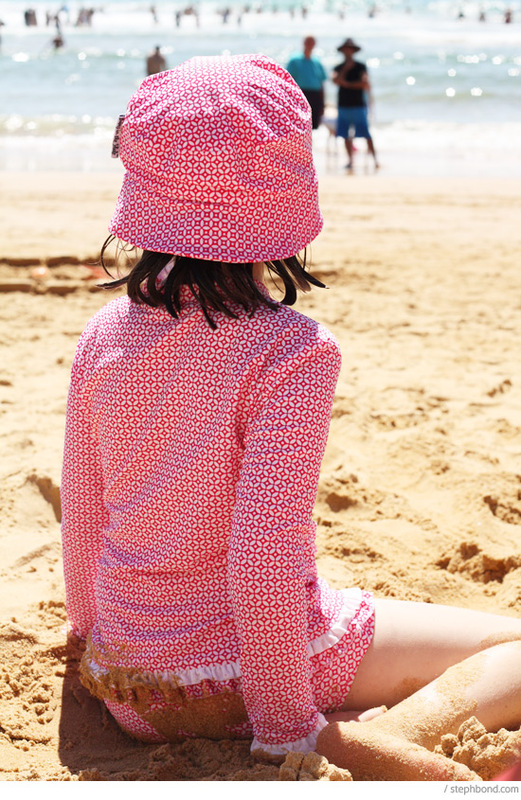 For more great Australian-designed pieces to cover up with after beach or pool time, try Choodie organic towelling tops, Three Sun Possum playwear, and Kaftan Kids kaftans for kids. Then it was back to the beach house for a long night of Rummikub (and said chocolate. and wine). 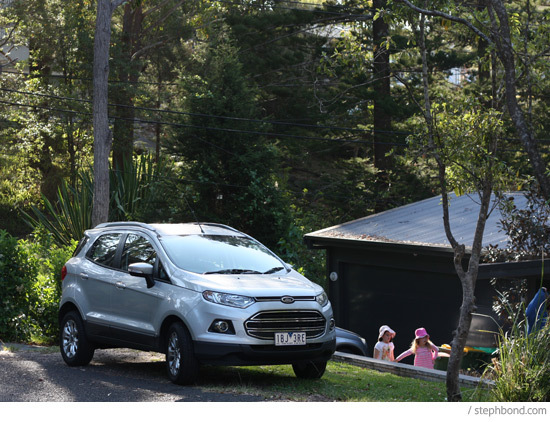 What an amazing weekend; thank you to our friends for having us at their beautiful beach house, and thank you Kidspot and Ford for the loan of the amazing Ford Ecosport Titanium. This is my final post in the challenge; you can also find my first Paint The Town Ford post Family Day Trip to Dural and Brooklyn, NSW, and my second post Living Local: Behind the scenes at Bondville here on Bondville. 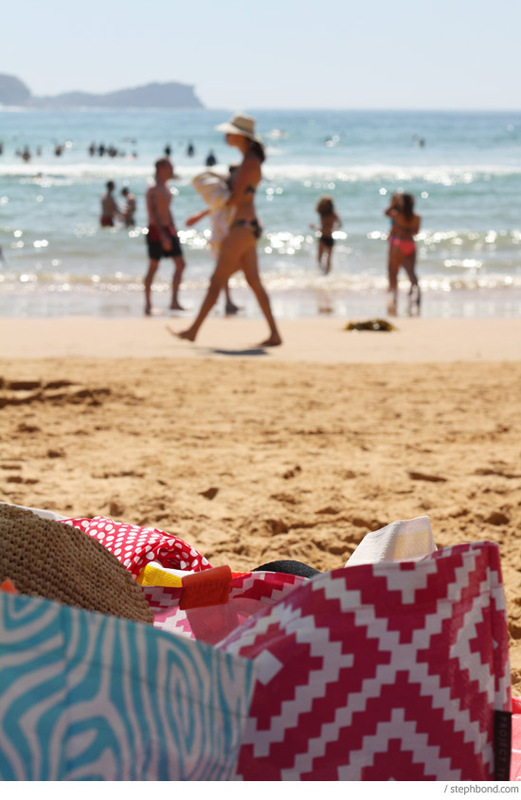 And to keep your and your littlies protected, learn more about being Sun Smart here. But wait, there's more. 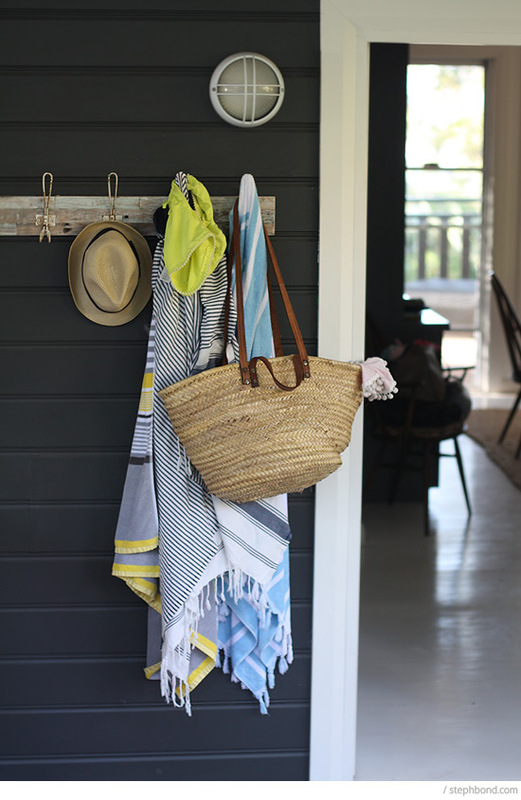 The very kind folks at Hollie & Harrie and Project Ten are offering gorgeous Australian Style beach prizes for two Bondville readers! 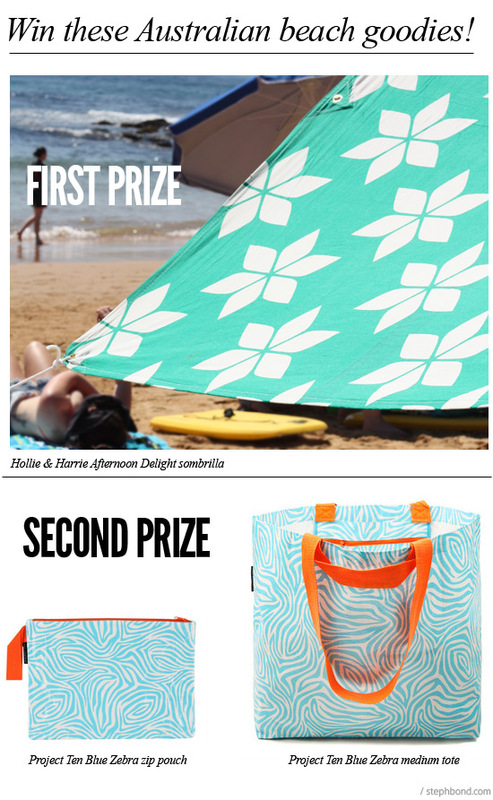 First prize is the Sombrilla beach shade featured in this post, valued at $198, and the second prize pack is a medium blue zebra tote and zipped pouch valued at $26.80 (plus free shipping). Simply comment on this post with your favourite Australian beach. Entries close midnight Friday 24th October 2014 AEST (Daylight Savings). If your blogger profile does not include your email address, please leave an email in your comment, or link to your contact information. 1. This is a game of skill. Entry via comment on this post on Bondville with your favourite Australian beach. 6. 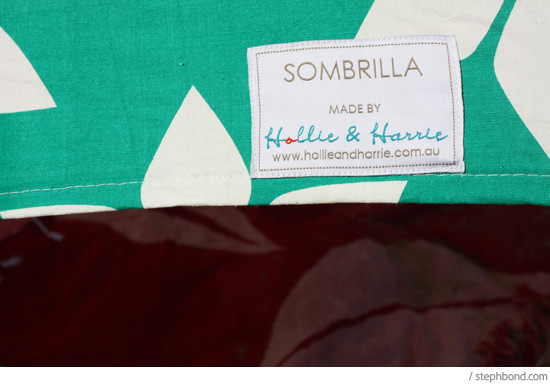 First prize consists of oneAfternoon Delight Sombrilla beach shade RRP $198.00 from Hollie & Harrie. Second prize consists of one Blue Zebra Medium tote RRP $16.85 and Blue Zebra Zip Pouch RRP $9.95 from Project Ten. 7. The giveaway opens on Saturday 18th October 2014 and closes midnight AEST (Daylight savings) on Friday 24th October 2014. 8. The giveaway winner will be announced on Bondville on Saturday 25th October 2014 and notified by email (if provided). If no reply by midnight 26th October, a runner-up will be chosen to receive the prizes. The Second Prize winner's name and address will be sent to Project Ten to dispatch the prize. We love freshwater beach -so family friendly, sheltered from the huge wave! Currumbin Alley, Gold Coast, you have the option of turquoise still water and dog friendly one side and waves the other, I stand up paddle with the pooch up the front while hubby swims next to us. Then it's off to the other side for a little sunbake, sunsafe of course. This pack would make our beach set up so much more comfortable especially with a little one on the way. We've always loved clovelly sheltered cove for the kids and snorkelling for the bigger people. Wattamolla Beach in the Royal National Park... it always feels like an adventure, driving through the national park to a secret hideaway. You can jump off the waterfall, float around on your inflatables on the lagoon and then it all opens out on to a beautiful beach. A perfect Sydney day out!! Moonta Bay, South Australia. Its a great beach for kids with lots of sand and small pools of water that are warm, shallow and fun for splashing in. We love Anaglesea beach , Vic. It has everything you need for a great day out......sun, surf and family friendly. My favourite beach would have to be Burleigh Heads - we are lucky enough to call it our local. There are so many options for everyone there - great surf, patrolled, awesome coffee, great burgers (!) and you ALWAYS bump into friends. Coolum Beach, Sunshine Coast - the perfect beach for our 3 young boys with "kid-friendly" waves to jump over and learn to boogy board on, headland rocks to climb and explore and super wide soft sand beach for games of beach cricket - always a favourite for family holidays. Little Manly ... a hidden treasure if you have kids. Long Reef is my favourite. It's so spacious!! Ok so my favourite beach may not be the most scenic, the quietest or have any iconic claim to fame but I LOVE Stockton Beach in Newcastle purely for the nostalgia. I have many childhood memories spent there that even reminiscing about it today brings a smile bigger than King Kong to my face! Love enjoying the atmosphere at Manly beach savouring top class fish & chips with beer! One Mile Beach near Port Stephens is just gorgeous. Long sandy beach with rolling waves, surrounded by spectacular sand dunes. Surf the waves or the Dunes - the kids love both. It may not be everyone's cup of tea, but my favourite beach is Bondi. Both sets of my grandparents raised their children in Bondi, two of them met (my mum and dad! ), fell in love and raised their two kids there. Well, until my brother was 10 and I was 5 when we moved to Canberra. Not much beach time then until my husband and I moved back to Sydney. 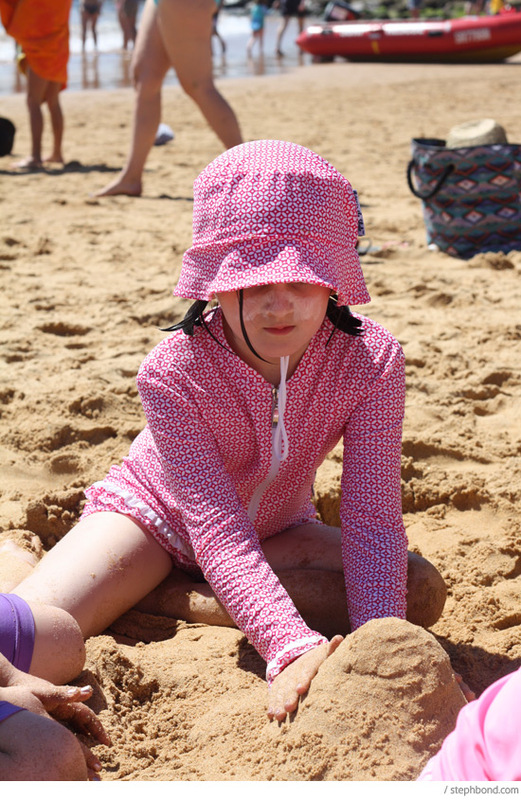 We love an early morning trip to Bondi, creating new memories with our daughter on the beach her mum, grand parents and great grandparents frolicked on! Love South Beach in Fremantle WA especially in the early mornings for a quick swim then down to the cafe for brekkie! Port beach during the day for when the dr comes for some waves! Coolum Beach, Sunshine Coast - the perfect beach for visiting with our 3 little boys - small wave sets for jumping over and learning to boogy-board, headland rocks to climb and explore, super-wide sandy beach for afternoon cricket. Our favourite family holiday spot. Murrays Beach in Jervis Bay- Picture Perfect! We love to cycle to Cottesloe beach & with the start of Nippers upon us we will be doing it every Sunday morning!! It is a gorgeous spot, morning and night - at sunset with fish and chips overlooking the Indian ocean - magic!! Yamba. My great grandparents built one of the first houses there when it was little more than a collection of sand dunes. Eighty years later 5 generations of my family have loved it. My grandfather was a lifeguard there, I was married there and it was the first place my children experienced the ocean. I hope it continues to be as dear to them as it has been to us. Balmoral Beach - It's not just a beach but a place where family and friendship memories can / have been created!! What can't you do here!!! So many memories are founded at Balmoral Beach because of what it has to offer – calm ocean waters, magnificent scenery, long open boardwalk, children’s playground, cafes, water activities, peaceful surroundings. From friends weddings, my first child’s baby shower, my children’s birthday parties, learning to “stand up paddle board”, watching my daughter feel the ocean through her toes for the first time, Australia Day celebrations, snorkelling, teaching my daughter to ride her bike without training wheels to farewelling long term friends and celebrating special occasions. Thank you Balmoral Beach. Please contact me via email to claim your prizes!